Base class for all geometric objects representing lines in 3D space. This is the base for all U-parametric object, implementing Evaluate() that returns a point as a function of the U parameter. Returns adimensional information on "how much" this curve is similar to another in its overall shape (does not matter parametrization or start point). Try with 20 samples. The return value is somewhat the "average distance between the two curves". Note that the result is affected by "weight" of curves. If it chnges from default 1.0, the distance estimation is higher/lower (ex: if a curve defines low 'weight' in its central segment, its CurveCurveDistance from another segment is not much affected by errors near the central segment). Same as before, but returns "how near" is complinesegm to whatever segment of this line (does not matter the percentual of line). Parameter U always work in 0..1 range. Computed value goes into the 'pos' reference. It could be overridden by inherited classes if a precise solution is known (otherwise it defaults to numerical BDF using the Evaluate() function). Reimplemented in chrono::geometry::ChLineNurbs, and chrono::geometry::ChLineBspline. Parameter U always work in 0..1 range. Computed value goes into the 'pos' reference. It must be implemented by inherited classes. 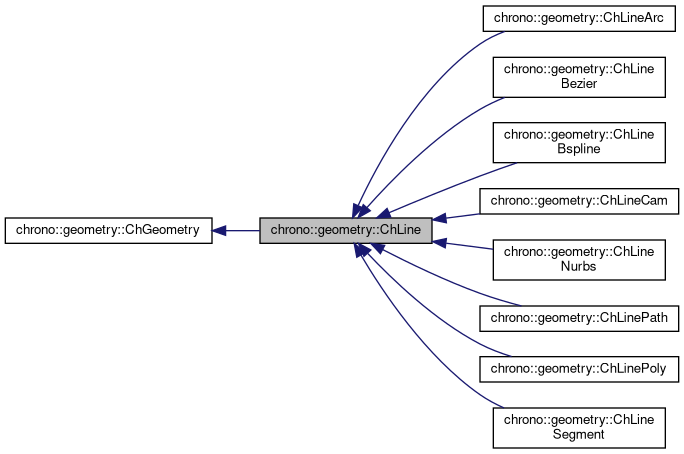 Implemented in chrono::geometry::ChLineCam, chrono::geometry::ChLineNurbs, chrono::geometry::ChLineBspline, chrono::geometry::ChLineArc, chrono::geometry::ChLinePath, chrono::geometry::ChLineBezier, chrono::geometry::ChLinePoly, and chrono::geometry::ChLineSegment. Reimplemented in chrono::geometry::ChLineCam, chrono::geometry::ChLineArc, chrono::geometry::ChLineBezier, chrono::geometry::ChLinePath, chrono::geometry::ChLinePoly, and chrono::geometry::ChLineSegment. By default, evaluates line at U=0. By default, evaluates line at U=1.